This is an actual Indiana billboard on Highway 65. We pass it every time we travel from Chicago to Indianapolis or on through to visit relatives in Cincinnati. 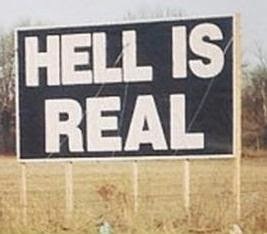 Sadly, with the political climate and the recently enacted so-called Religious Freedom Restoration Act, Hell IS Real for any Hoosiers who are not straight, white, male, right wing Christians! It breaks my heart to imagine all our gay friends traveling through the endless cornfields of Indiana and being denied gas, food, lodgings or even a bathroom break just because of who they are or who they love! It's archaic and just plain wrong on so many levels. What if someone's "religion" prevents them from serving African Americans or foreigners, women, anyone with tattoos and piercings, or whatever. Take your pick. It could be YOU. We believe America should remain a free country where differences enrich us all, hate is not protected by law, and corporations are not entitled to personhood status and more human rights than actual people. Please speak out. This is not an issue of religious freedom, but a power grab on the part of extremists that sets a dangerous precedent for entire states to discriminate against and deny service to anyone for any reason. Race, sexual orientation, religion, and gender should never be legitimate reasons for a business or a government to deny serving someone. Indiana and now Arkansas have enacted Religious Freedom Restoration Acts and other states are considering doing the same. Please boycott Indiana and Arkansas so they'll stop legalizing bigotry, prejudice and hatred. The backlash against these laws needs to be swift and effective. States will only overturn hate laws if we hit them in their wallets.